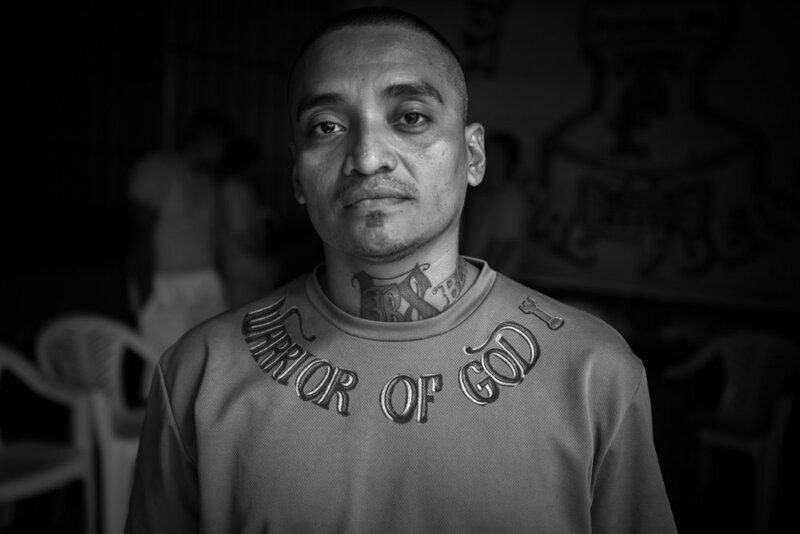 For more than 20 years, the country of El Salvador face an endemic violence related to gang activity. There are between 10,000 and 70,000 active members in a country of just 7 million people. While a new Assembly was elected in 2018, the political class, all political parties combined, has so far only promoted measures increasingly repressive, without removing the gangs. As a result, the prisons have filled up, exploding their capacity of reception, while the public programs of rehabilitation are almost non-existent. Only some evangelical churches welcome those seeking to break with their past lives, even if their action is not always well accepted by the public forces and the rulers. The assistant of the general pastor wears a sweat-shirt with the writing “Warrior of God“. The inmates and former gang members, consider themselfves as an army of God. The yards 4, 5 and 6 of the jail, the inmates, are gattered to realize the worship of the Final Trumpet church. The Church was created in 2010 inside the jail and start to gain the three yards on 2016. Prisonners of the yards 4, 5 and 6 of the Gotera jail participe to the worship of the Final Trumpet church. 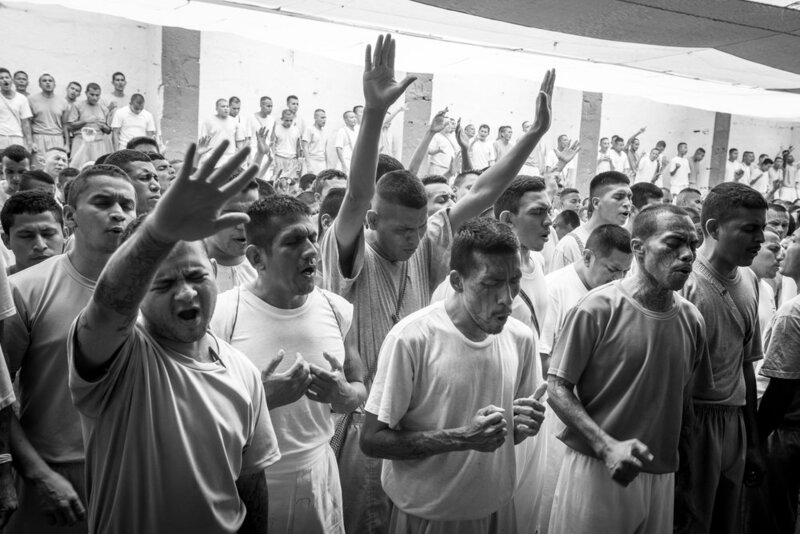 Prisonners at the 4,5,6 yards of La Gotera's jail pray at the worship of the Final Trumpet church. 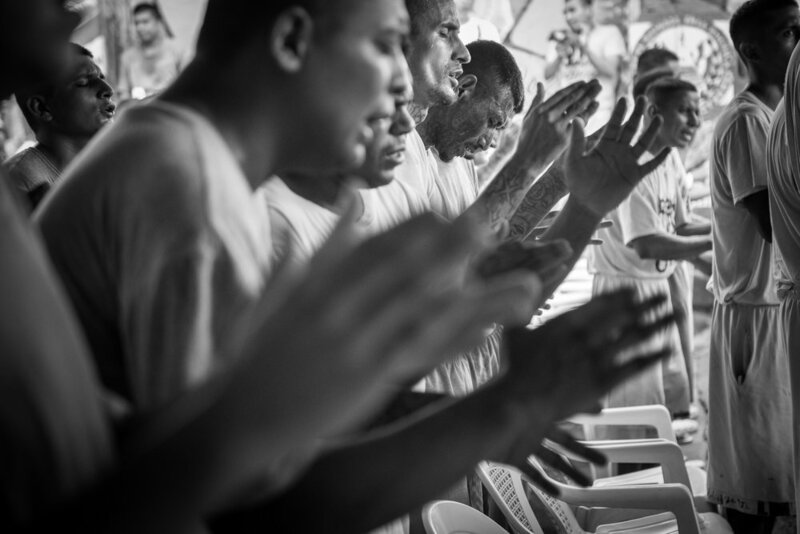 The inmates of the yards 1, 2 and 3 of La Gotera prison participate to the worship of the "Strong Town" church. In the center, one of them has the name of his former gang Barrio 18 tattooed on the skull. 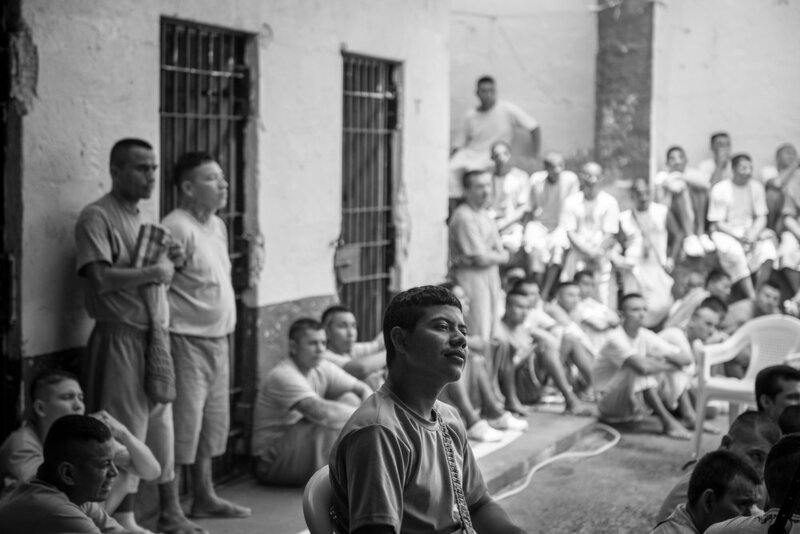 The inmates are listening the pastor talking at the time of the worship in the 1,2,3 yards of La Gotera's jail. 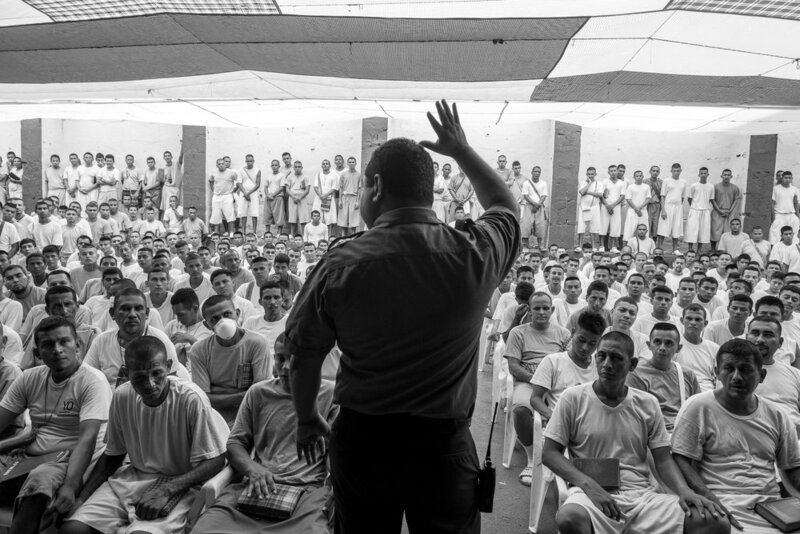 At the time of a worship, Manuel Rivera, pastor of Strong Tower chruch gives a speech in front of the 827 prisonners of the 1,2,3 yards of La Gotera's jail. This part of the jail is recently converted to Christianity. The rules the converted prisoners have to follow. between them, "2. Respect and obey to the ecclesiastic and civil autorithies". A painting sheep represents the prisoner to symbolize the belonging to a herd led by the pastor. 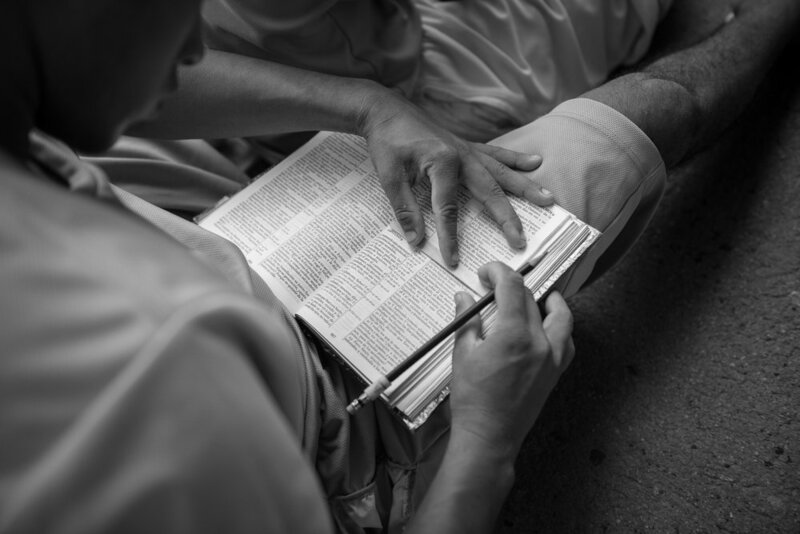 The inmates study several kind of knowledge but always mixed with some allusions to "Christian value". Prisoners of the yards 1, 2 and 3 of La Gotera jail participe to the worship of the Strong Tower church. The tattoo on the arm of the prisonner is a triple 6 that means 18, the name of the gang. The tattoo is barred.The triple 6 apoints also the name of the “Beast”. 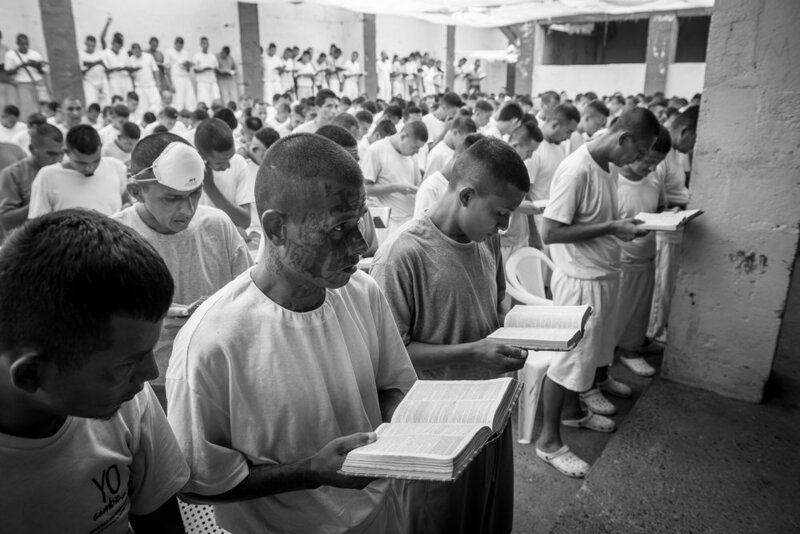 At the time of a worship, a prisoner with tattoo on his face is listening to the pastor. 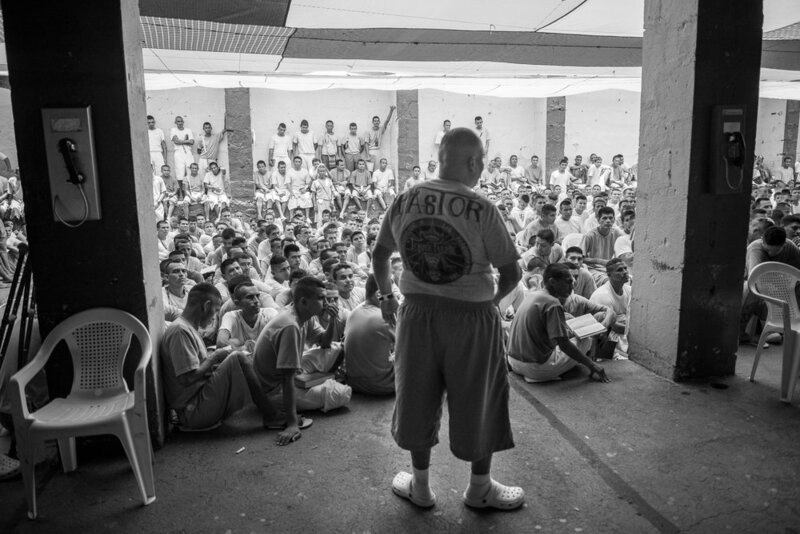 At the 1,2 and 3 yards of the jail, the director gives a speech to the inmates. 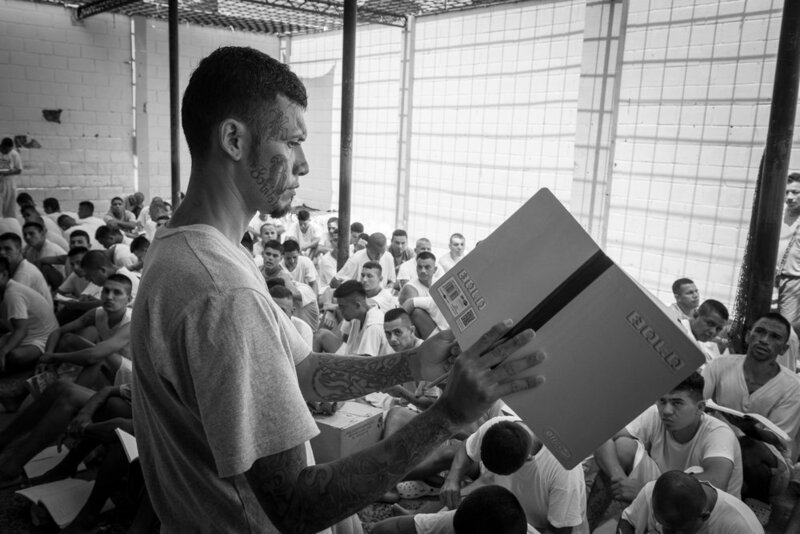 An Inmate is reading his Bible and taking note. At the center, "Champo", a well-know leader of the 18-R gang in La Dina colony, participes with commitment to the worship of the Final Trumpet church. The director of the jail tells that 120 gang leaders were converted to Christianity in the last months. Prisonner at the La Gotera's jail. 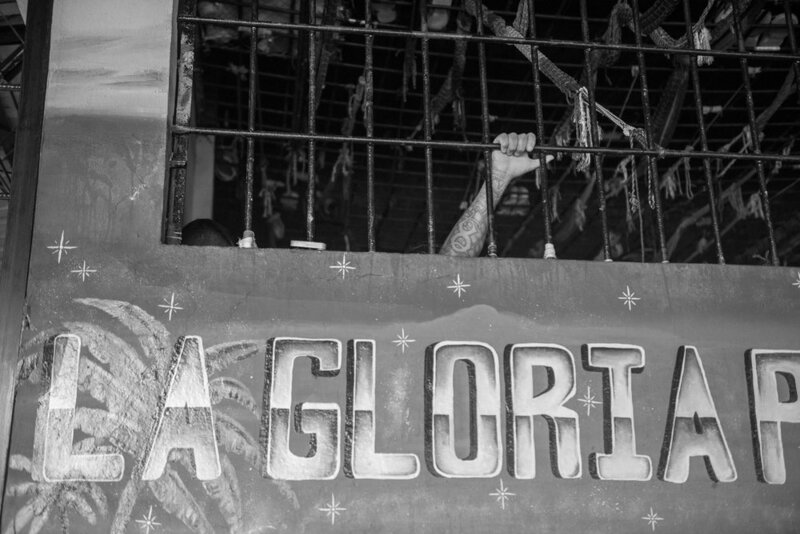 Inmates of the 4,5 and 6 yards of La Gotera's jail gathered at the time of a worship. The life conditions are distressing at La Gotera's jail. There is an unsustainable warm. The food is bad and reduced, and the water is strictely rationed. The numbers of prisoners exceeds totally the cappacity of the jail. Conversions to Evangelical Protestantism are usually done in prison. 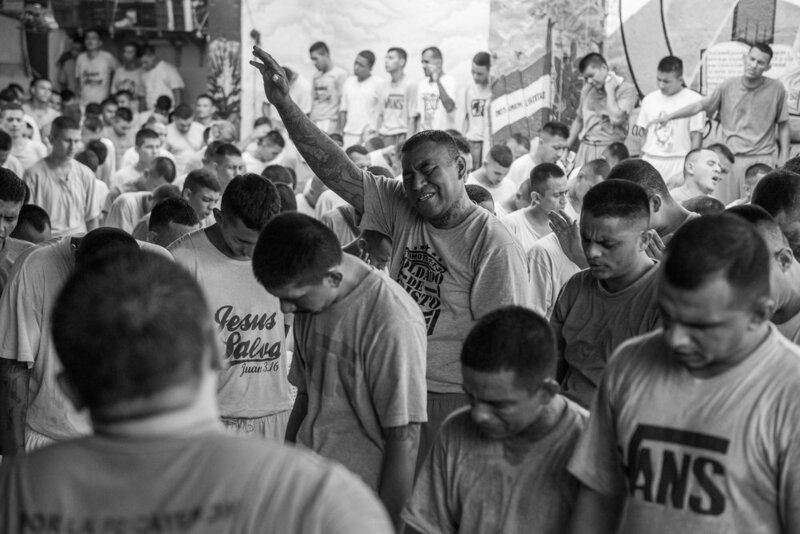 One of them, located in San Francisco de Gotera, in the north-east of the country, reveals the extent of the phenomenon: the 1,500 prisoners sentenced for their activities in the gang Barrio 18, are now all fervent Christians evangelizers. According to the prison director, half of the prisoners are serving a sentence of more than 30 years (and a quarter more than 50 years). They are therefore unlikely to be granted an early exit thanks to their good behavior. Conversions are based on true faith: their only opportunity is this "encounter with Jesus," which leads them to repentance, the possibility of receiving forgiveness with a rebirth to consecrate their lives to Jesus. It is also the possibility of finding an inner peace, as a way out to their inner liberation while accepting the conditions of their material existence. Religion also provides a coercive framework, with the respect of an authority, a God whose omnipotence becomes indisputable, just like the world order and its authorities. It serves to regain control of the space from 2016. At the same time, the "extraordinary measures" were put in place. El Salvador had the highest homicide rate in the world. Highly contested by international institutions, these measures completely isolated the prisons where gang members were imprisoned. The goal was to break the chain of command between the incarcerated leaders and their base in the neighborhoods. Today, extraordinary measures have begun to be taken in La Gotera Prison. 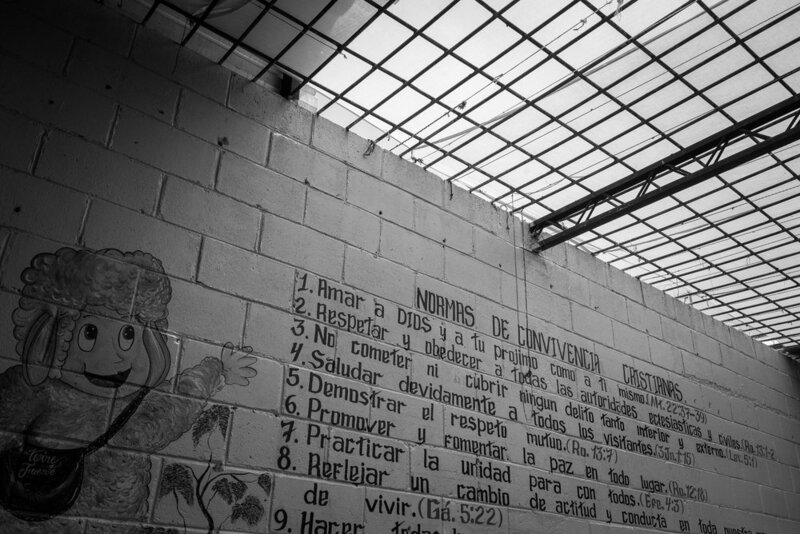 Because the prison, as an evangelist jail, no longer represents a danger. But as religion took power, politics measures seems to hold back.